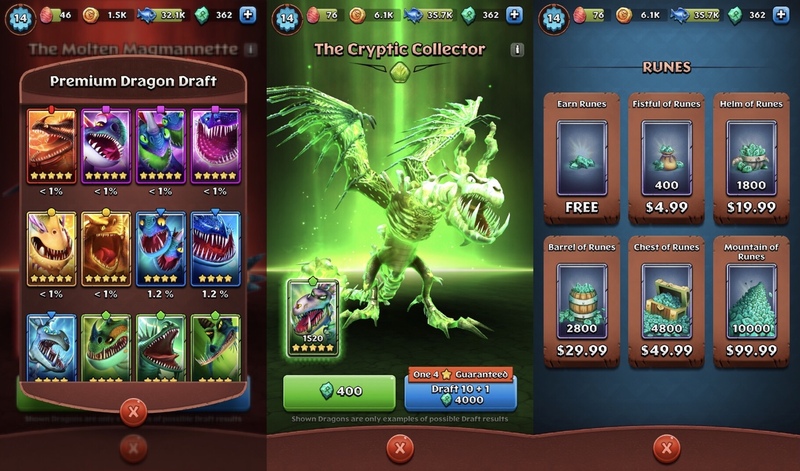 I don’t normally play or review free-to-play match-three games, as I know that they’re almost always going to be pure garbage, with progress linked to how much real world money you’re able and willing to spend. But I like dragons, and I like the How to Train Your Dragon franchise and am looking forward to the upcoming movie The Hidden World. I also like match-three games when they’re not filled with predatory in-app purchases like power-ups, energy and lives. So I figured I’d at least give Dragons: Titan Uprising a chance in case it’s not as bad as I’d expect. At first it actually seemed like I might be able to enjoy it despite its constant attempts at taking my money. But then my progress slowed down to a crawl and, despite really wanting to play, the game simply would not let me. So I decided to review it instead. First, the good. I admit I haven’t played a lot of these re-skinned match-three games because of my low expectations, so I don’t know if these mechanics have been used before. For me, they’re new, so I’ll mention them. Each levels consists of several waves of enemy dragons you need to battle your way through. You do so by swapping colored gems to make matches of three or more. There are five colors and your dragons can be any mix of those colors. Each color is weak against one color and strong against another. So you can’t just go for the biggest matches, as they won’t always be the most powerful. Also, the matched gems fly up and hit any dragons directly in their path. This means you have to not only worry about the color, but where the matches are on the board. If they hit empty space or the wrong dragon, it could be a waste of a move. This was new for me, as I’m used to damage just automatically hitting enemies, no matter where the matches are. So if it is truly an original idea, I applaud them for it. It forces you to really think about each move. On top of that, each match you make charges up the dragons of the same color. Once they’re fully charged, you can use their special skill, which doesn’t use up a turn. 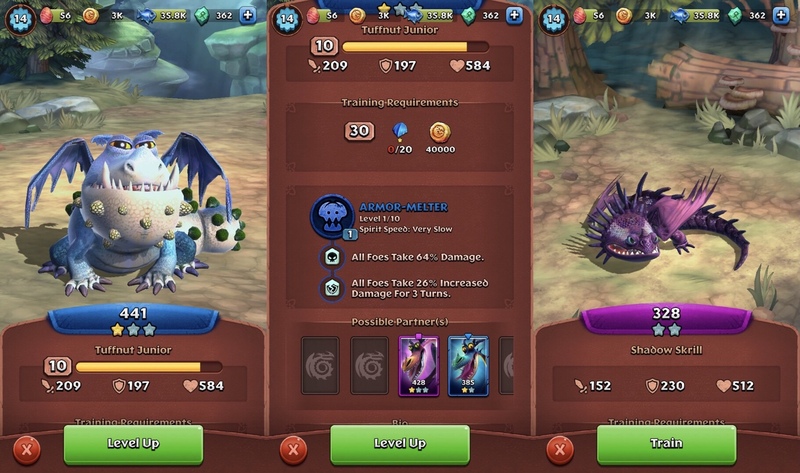 Choosing the right dragons for their skills, such as healing or damage, is all part of the strategy. New gems are also added from the bottom instead of falling from the top, which can be a bit hard to get used to if you play a lot of these games. You may plan out a move and realize too late that it only would work if the gems fell downward. But this also makes the game feel different from every other match-three out there. The main issue with these battles is that you might take the right colored dragons in to exploit the enemy weaknesses, but then not get enough of that color on the board. This isn’t new to the genre, though. It’s well-known that there’s a lot of luck to these kinds of games, whether they’re full of IAPs or not. But if you’re dealt an un-winnable hand, usually you’d just try again until everything falls into place and you win. You might even try a different team of dragons with more useful skills. But you can only do so if the game lets you. And that’s where the biggest problem lies: energy. I would be happy to keep working at a difficult level by trying out different strategies. That’s where games are the most fun, not when you can easily breeze through the whole thing. Overcoming challenges through practice and strategy is the most rewarding part of gaming. But, as with so many other free-to-play games, Titan Uprising has an energy meter. Each battle costs between three and six energy, but maybe more later on. You don’t lose anything for being defeated in battle, but you do have to spend more energy if you want to have another go at it. After several days with the game, I’m level 14 and have just shy of forty maximum energy. So I can play at most ten battles before I’m out. This also means, no matter how long I spend away from the game, I will never regenerate more than that. If you’re having trouble with a main story mission, or are running low on a material, you can try taking a side quest or replay older quests. But those also cost energy. So once you’re out, there’s really nothing you can do but put the game down and wait. But there’s another wrinkle. Unlike similar games, the energy doesn’t have a timer on it to show you how long before you earn more. I swear I’ve checked in after an hour away and only saw one or two energy replenished. It doesn’t really make sense to me to play one battle every few hours, so instead I’m basically playing once in the morning and once at night, not necessarily with full energy. Because of this, I didn’t make any progress for several days, as I was having trouble passing a specific level. I would burn through my energy, try to level up some dragons, and then try again. I finally got through it and made some progress again, only to hit another wall. That’s because the enemy dragons keep getting stronger, but my own don’t really. Dragons don’t earn experience through battle. They remain unchanged from battle to battle unless you go out of your way to level them up. To do so, you have to sacrifice one of your other dragons, and also have enough fish. Sometimes, you also need dragon scales of that color. The fish became less of an issue as I progressed, but the scales are now a problem. They’re earned through specific missions, and the colors are specific to certain days of the week. So if I want to level up my green dragon I just hatched, I need green scales. If I don’t have them and I have no way of earning them, all I can do is wait. I also need scales to hatch some of the eggs I find, but I didn’t even realize that was an issue until I was out of them. On top of that, leveling up a dragon gives them exactly one attack point. Yes, one. You need to sacrifice another dragon plus all the scales and fish needed for it just to give one of your dragons one extra attack point. I’ve been at this for days and haven’t even managed to get a second gold star on any of my dragons. Now, of course there’s a way around most of this nonsense. If you run out of coins or energy, you can use runes to replenish them. You earn runes very slowly through normal play. If you want to have nearly enough to actually do anything useful with them, you’ll need to buy more with cash. You can also use runes to get new dragons, but they’re random and the chance of a rare powerful one is slim to none. Yes, it’s a free game, so maybe you decide you want to drop a few bucks to support the developer and get a better dragon. To get anything more than three stars, you have to spend 400 runes for one spin. That’s $4.99. Not to actually buy a powerful dragon, but to have less than a 1% chance at one. You could just end up with another 3-star dragon for that money, even one you already have. There’s even more nonsense to deal with, like upgrading your hatchery, treasury and fishery, which all cost more gold coins than you’re likely to have at one time unless you buy more with cash. It’s really a shame that they decided to turn the game into what amounts to little more than a slot machine. The dragons look great, almost like they came right out of the movies. They’re detailed and they have personalities. You can even pet them. And they’re especially cute as babies. I’m far more impressed with the interactivity of these dragons than I am with, say, the Pokémon in Pokémon Go. I would love to be able to play this game normally and make normal progress instead of constantly worrying about eight different currencies. As is, I’ll likely either delete it soon or just forget about it and move on. When a game goes out of its way to stop me from playing, I usually oblige and do so. 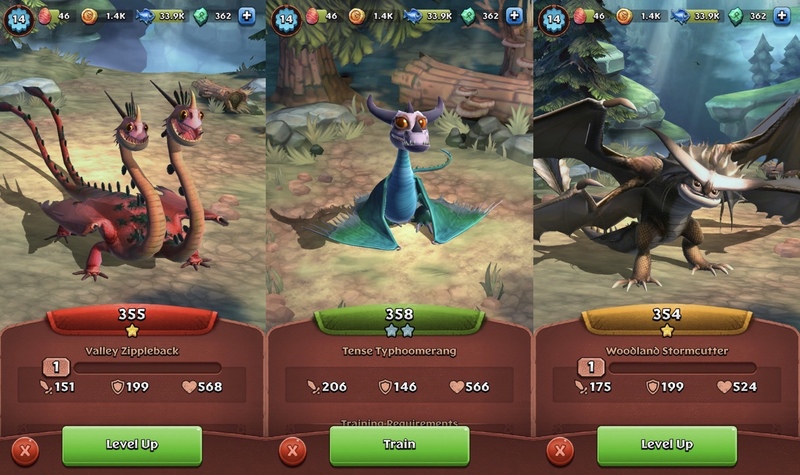 At this point, I would say download the game and play a bit if you just want to mess around with the dragons a bit, pet them and just watch their animations. You’re going to need a lot of patience to make any real progress with the game itself. And I’m not sure if the battles even get more interesting, as I’m on the third world and the only time I noticed something different was when I fought a boss who would tangle up some of my gems. It’s possible more mechanics are added later, but I’ll probably never find out. Even though it was somewhat expected, I’m disappointed that an official How to Train Your Dragon game goes so out of its way to prevent you from training your dragons. If you still want to try the game, you can download it here, but come with oodles of either patience or money. And if you need some tips and tricks, try my walkthrough guide.